I tend not to post when I have a lot on my mind that I am trying to work through. Sometimes it may be personal, other times work or even career. In the past few years I have had a lot of new things happening in my life that cause me to ponder many things, especially about the future. Recently I have been thinking about my own career path and what it all means. Social media has added an interesting realm to my life and I am not going to say it hasn’t brought struggles too. I strive to be as open as possible with things, but sometimes you have to come to conclusions on your own. I love leading the way, whether it be with a team or a movement for Customer Service. I never strive for the status quo, especially with work. We all need to continually evolve our abilities and companies need to broaden their horizons to meet an ever changing Customer. My style is not playing politics but instead concentrating on the Customer story and what is in front of me at the time. Sometimes in doing this people that are close to the process work off of their own historical information. I am lucky to work with many that have great experience in the cable and telecommunications industry; I learn a lot from them every day. My background is financial services, which provides more of an outsider view. Sometime this makes me feel like a misfit. I talk to many businesses regarding their efforts in social media. In fact I have been approached by many companies about helping them build their efforts. Most companies channel their social media through marketing or PR. It is funny the reaction I receive when I tell them that I am just a simple Customer Service guy. The marketers tend to be so stuck on the brand and sales, so they do not always see the community and relationship aspects in the space. I have many friends in marketing that have built a similar view as mine, but they are already successful in the space. Some in PR concentrate on the message as opposed to the relationship. My view is this space is about the Customers, helping, listening and having conversations with them. So as I talk to these different companies I recognize what a misfit that I may be. I then look at all my friends in social media and I realize how different we all are. It is these differences that make social media such a great place and a way to hear others perspectives. As I was sitting pondering recent events, my own place in life, and how we all connect, I started to realize we are all in this place of misfit toys creating a home for all to enjoy no matter who they are, what they have been through, or where they are heading. Being this misfit is a trophy we all carry because we are leading and doing things in a different manner. Whether we are doing this online, at work, or within our home life we are carving this new path. 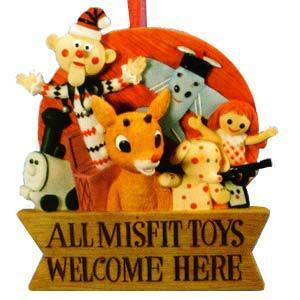 The misfit toys have found their home with each other. What do Murals Teach Us About Leadership? This is a follow up to my post titled “Part of Leadership is Giving Back.” In that post I spoke of the importance for leaders to give back to the community, but I did not address what really makes a leader. We call many people leaders as a sign of respect for a level they attained in life or business, but that is not leadership. Leadership can take many forms and in many areas in life. To me a leader is someone willing to take risks, and do something completely different. Not because they are told to, or because others are having success doing it, but because they believe it is the right thing to do. Leading the way has risks, and many failures, but that willingness to have the insight and accept the risks make the person a leader. In business we see many following others. One of the areas that I have seen a lot of following is with process improvement programs. When Motorola had great success with Six Sigma, every company seemed to jump on the bandwagon in embracing the Six Sigma concept. Black belts and green belts were everywhere. I think it is a great program, in fact my wife was a green belt with GE and I was trained on the program at the Vanguard Group, but implementing this based on the success of others is not leadership. It is simply following. Risk in implementation was minimal based on the success already demonstrated by others. I know many may say that even Motorola was following the lead based on work of many in Japan. This is correct, but the tools and concepts developed by the Motorola team were innovative and took the concepts to another level leading to the popularity in American business. So what does this all have to do with murals? Well over the past 2 years I have worked at Comcast I have had an opportunity to be a part of incredible life experiences. To me the greatest of these experiences was the opportunity to hear from Jane Golden about the creation of the Philadelphia Anti-Graffiti Network, which has evolved to the Philadelphia Mural Arts Program. As part of the leadership program that I am luck to be a part of, Jane joined us to discuss the history of the Philadelphia Mural Arts Program. Imagine the year 1984 in the streets of Philadelphia. Graffiti was a major problem, just like most major cities in the US. Jane Golden came in and took the unique approach of embracing those that were doing this graffiti and providing them a more structured outlet to release their artistic energy. Many could not believe that someone would invite perceived criminals into her home. She helped them harness this energy and release it into amazing works of art, like those on this page. Today the Philadelphia Mural Arts Programs is considered to be one of the best in the world. Others often attempt to imitate it. People travel from all around the world to see the amazing show that is part of the landscape of Philadelphia. All started through the vision of Jane Golden. Many of the people that joined the program from the streets have gone on to college and paved their own path in the arts, business and many other fields. I am sure they are now leaders on their own, thanks to the mentorship of a true leader in Jane. The moral to the learning was part of leadership is going against the expectations of others and setting a path that moves your team, organization or simply yourself into a uncharted territory. As we celebrate the 25th anniversary of the mural arts program, I would like to thank Jane for her leadership. The work of the program is cherished by so many. How do you lead each day? Who are some of the unsung leaders that have made a difference in your life? Visit http://www.muralarts.org/ to learn more. If you are in Philadelphia, I highly recommend going on a tour! In social media, the basics of service are no different than any other communications channel. I find it interesting to watch companies work within social media to try to engage with their Customers. It is obvious to me that there is still a fight as to who owns the social media interaction. In most companies it is either PR or Marketing, but isn’t Customer Service the area that talks to Customers? Many can say this is a new space and companies are learning. I agree with that, but there is enough information out there to know what approaches tend to work best. If you are there for PR, or even marketing, it may not be necessary to personalize the interaction, but for service it is a different story. The trouble is many in marketing or PR view this to be all about the brand. I have a little hint for you, the company or department does not own the space, your Customer does! So how does the basics of service matter? Because this is how all interactions should be, no matter the channel. When someone calls your business do you answer the phone “XYZ Company, What do you want?” No, most businesses answer the phone XYZ Company. This is Frank speaking, how may I help you?” The first key aspect that you learn is the human connection is so important. Unfortunately this space, companies are too focused on the brand not their Customers. You do not have to look at my Twitter handle to see this success, just look at Dell, who was truly a pioneering company in the space. They have recognized this for years. Now Zappos provides an even more in depth look. They encourage, and teach, all their employees to participate in the space. Now that is personal. There are many ways to personalize Twitter. My preference is different ID’s for different people, but I can understand why that may not be the preferred method for some companies. Below are a few companies that are doing it right. Ford has Shawn handling the FordCustService account. QuickenLoans lets us know via the bio section that it is Kelly helping out, and Office_Live demonstrates a way to have multiple people on the same account. Charter, and the UMatter2Charter team have been doing a good job in creating that personal connection. They use separate accounts and they connect with their Customers. Don’t you prefer to interact with a person? I know I do. Other basics to serving Customers is to have a conversation, do not sit there marketing outward the whole time. Also, just like a call, make sure you resolve the Customers needs prior to offering sales. This is where companies really make it about them, instead of their Customers. I applaud all companies for trying to find ways to have success in this space. I am always happy to see new companies learn about social media and ways they too can participate. Who are some other companies that you view doing it right on Twitter? I have had many discussions recently with people striving to be seen in this overwhelming world of social media. They seem to want to be noticed, but find it difficult to be seen. This caused me to think about what is different and similar between the world of social media and what we experience everyday. I started to think about some of the people that are talked about in social media, such as Guy Kawasaki, Gary Vaynerchuk, Tony Hsieh, Chris Brogan, and even myself. What do these individuals have in common? We are all very different, but we show our passion everyday. Well it is not as simple as the term passion. There are a few things to know how the world of social media is different than a normal day at the office. In the office a lot of it is about playing politics or the internal workings of a company. Rewards are based on many factors such as who you know, or how you portray your performance. In social media it is different. Those that are false in any way are called on it or people do not connect with them. People love to connect with people they relate too. This has been the success of most of the people I listed above. As soon as I thought of this post, I immediately thought of the best example: Gary Vaynerchuk. What is interesting I did not even know Gary was coming out with a book until I went to link his name to his blog. The name of the book is “Why Now is the Time to Crush It! Cash in on Your Passion.” I was lucky enough to see Gary speak at a number of events. Each time I have left inspired by his passion. He has demonstrated how businesses can be successful in this social media world. His passion comes through in every Wine TV show. It is about teaching people about his love of wine. I first met Gary at Blog World, sitting at the Bare Lounge. He was a down to earth regular guy that I enjoyed speaking to. Of course this did not prepare me for the dynamic person that I would see on stage. Both were the same person, but when we were chatting it was not about his passion, just things like travel, Vegas. But when Gary was on stage talking about his business, wine, social media and football (I still hope he buys the Jets) he shined. Literally within minutes I found myself watching Wine TV. Watch and learn and you too can cash in on your passion. Better yet, buy the book I am sure you will see his passion. No one would dispute Chris Brogan’s passion for social media, and it shows in everything he does. He is always trying to help people have the same success and he loves to have that conversation. Some will say Tony Hsieh’s passion is service, but from talking to him, the passion I always saw was the Zappos culture; Customer Service is just part of the culture. One of the first stories I heard from Tony was when he grew his first company, it lost the culture he loved when it was a start up. Just looking in Tony’s eyes when he said he was determined to not let that happen again. It was at that moment, I knew the passion was Zappos culture. I have only met Guy Kawaski once, but I have read a few of his books and he has a clear passion for business. I can tell by his tweets that he loves social media, and new ways to incorporate social media with traditional print media, but I still think the passion people love to connect with is business success. We have all seen movies where the reporter is doing the story, and when the camera cuts they are no longer the nice person they were on camera or they storm off to something more important for themselves. Through many other means it is possible to fake it, but in social media the camera is on all the time. You can not hide it. You will be noticed. I also believe social media will continue to change the culture of business, and I think it is always important to find ways to let your passion shine. If you are in a position where you feel you can not, it might be time to find something better suited for your needs. For myself I have been doing a lot to understand my long term goals, and how to achieve the most for myself and my family. I thought long and hard about what at work drives me the most. As I thought about it, it was not social media, marketing, or PR. My passion is simple, Customers. I want to always be in a position where I can let this passion shine. What is your passion? How do you crush it?